Big Bend gets its name from the big bend the Rio Grande takes here in the desert and the national park shares 118 miles along the river with Mexico. I was more excited to cross the border than I was to visit the park itself and I really enjoyed the morning we spent in Boquillas del Carmen. Do not forget your passport!! To cross the river there's an international ferry that costs $5 US per person round trip. The "international ferry" is a rowboat that will ferry you across to a stable of awaiting donkeys that will shuttle you into town, also for $5 each. You can also pay a bit more for a ride up in a car, or choose to walk into town for nothing. It's only a mile walk and very doable, but, donkeys! You'll need cash for ferry and donkeys at $5 per person RT, meals were about $8-10 dollars per plate (prices were the same as what I saw in Terlingua), $2-3 for a soda, etc, and souvenirs were $8-10, and cash to tip your guide. Try to bring small change, aside from the restaurants not everyone may have the change you need. Once you get into Boquillas your first stop is a white trailer that serves as immigration where you'll get your passport stamped. You need to report back here on your way out of town as well. When you cross back into Texas you'll go through immigration via El Paso, by scanning your computer into the passport reader and speaking with an agent in El Paso over the phone. It's all very easy and painless and there is a border control agent there to assist you. There are English-speaking guides who will take you into town and show you around. You don't need to have a guide with you (but if you go with a donkey, someone will be with you guiding the donkeys), and if you do choose to go with a guide it's up to you how much time you spend with them. Since we speak Spanish we preferred to walk around by ourselves. But we did enjoy getting to know our guide on the walk into town and on our way back to the river he took us on a detour to show us the hot springs and a beautiful viewpoint over the Rio Grande. At the end of the day tip your guide. There are two restaurants to choose from and a bar. 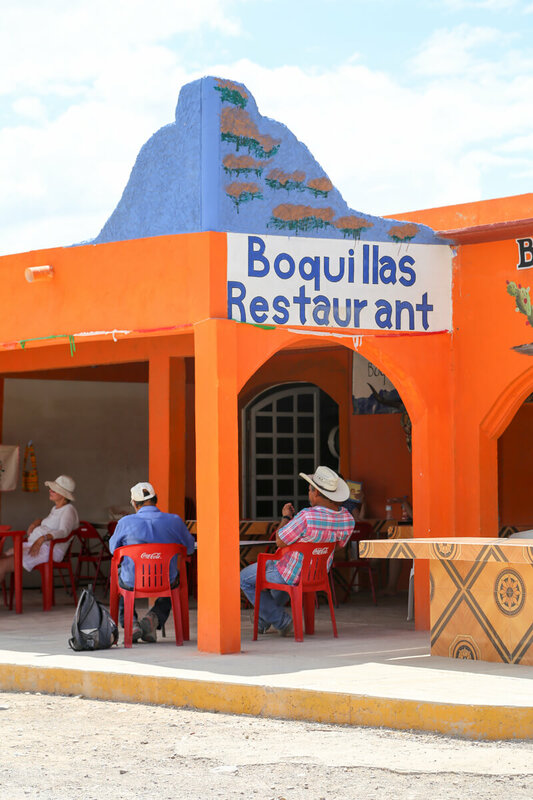 Jose Falcon's and Boquillas Restaurant are the restaurant options. We decided to eat at Falcon's and have a drink at Boquillas Restaurant. I got some guacamole and enchiladas while we enjoyed a brief respite from the blistering sun. After lunch, we walked around the village. It's a beautiful little town with a certain charm and everyone we talked to was very kind. People were selling handicrafts in booths or from the porches of their own homes. We bought some embroidered tea towels and a roadrunner made out of copper wire from an older couple, then we headed back to Boquillas Restaurant for a drink and another break from the sun. Buy your souvenirs here, not from the displays set up within the park on the US side of the border. Those are set up illegally, but you can legally bring back everything you purchase here. Don't buy anything made from an animal product (bones or feathers) or from any stones. Those would be confiscated in customs upon your return. We spent a while sipping on tequila and sotol and talking to everyone at Boquillas Restaurant. Sotol is similar to tequila but is made from harvested wild agave in the region of Chihuahua. The border crossing was closed in 2002 due to increased border security and didn't reopen for ten years. Boquillas suffered. It was a town that had survived on the border. Tourism brought business, and supplies and food were more easily accessed at the border than from other cities in Mexico that were much further away. The town nearly became a ghost town as the students left to study in schools in other cities and younger adults looked for work elsewhere. Since the border has reopened the town has come back to life and most have returned. Everyone we talked to on either side of the border had something to say about the years the border was closed, and most people seemed passionate about keeping it open. Our Airbnb host even started a music festival on the border in Lajitas where musicians and bands on the US side take turns playing music with bands on the Mexican side. Local businesses and people donate BBQ and drinks on either side and the two communities become one. For more information click here: Voices from Both Sides.